Your PC’s audio setup is probably one of the last things you think about when upgrading your system, but adding one of today’s best gaming headsets to your PC can dramatically improve your gaming experience, offering immersive soundscapes that are infinitely better than listening to the tinny tunes coming out of your monitor speakers as well as a built-in microphone for chatting to your mates online. But one person’s best gaming headset can be another’s absolute nightmare, which is why I’ve gathered together a range of today’s best gaming headsets that hopefully cover all bases across a smattering of different price points. If your PC is in need of an audio boost, then step right this way. Of course, any list of best gaming headsets is always going to be highly personal based on the person compiling said list. For me, there are three things I like to keep in mind when choosing a best gaming headset: comfort, audio quality and microphone clarity. After all, it’s no good having a great-sounding headset that pinches your skull after 30 minutes of use, or one you can’t use online due to the sound of its hissing mic. Comfort is a particularly big priority for me, as a lot of gaming headsets tend to give me a headache after not very long at all. 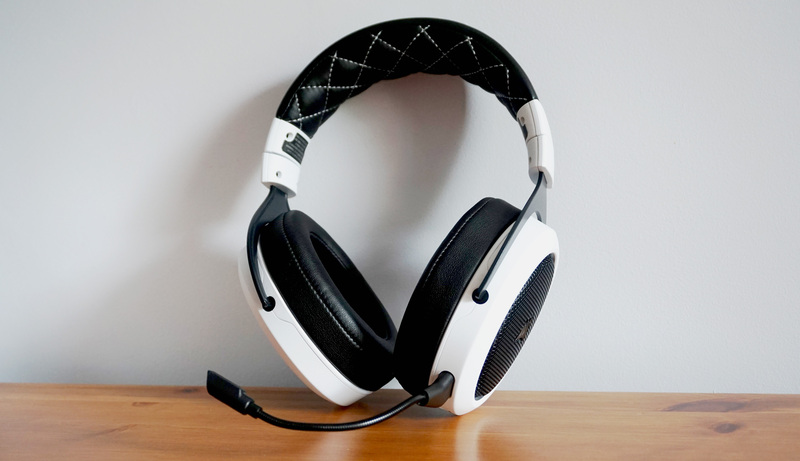 As a result, you can be sure the ones on this list are the comfiest headsets money can buy. My musical tastes also sit on the more balanced side of the audio spectrum, as opposed to the pumping bass end of things, so every headset you’ll find below delivers a clean, clear sound that gives as much emphasis to the highs as it does the lows. If you’ve ever had as much trouble finding a comfortable headset as I have, then the Steelseries Arctis 7 is a revelation. Its ski-goggle headband might not look as comfy as other headsets with fistfuls of padding to their name, but its clever suspension design means the steel frame never actually touches your head, allowing me to wear it for hours and hours without issue. Whereas other headsets often always leave me with a vice-like headache after 30 minutes, the Arctis 7 just lets me get on with playing games. It sounds great, too, and is completely wireless, allowing you to keep your gaming desk nice and clean without another tangle of cables in the mix. What’s more, its wireless transmitter isn’t just a little USB stick – it’s got its own cable, so you can position it wherever you like for the best signal. You also get a regular 3.5mm audio cable so you can use it as a wired headset as well if you prefer. The Arctis 7 is more expensive than other wireless gaming headsets on this list, but it does come with a couple of extra handy features, such as its ChatMix slider. This lets you filter out all game music to focus solely on your multiplayer chat, and it works vice-versa as well, helping you drown out those screaming 11-year-olds who can’t believe you didn’t make that headshot from half way across the map. If your budget doesn’t quite stretch that far, then fear not, as the rest of Steelseries’ Arctis range uses the same exactly the same audio drivers as the top-end Arctis 7 as well as the same comfy headband design. Read more in our Steelseries Arctis 7 review. The Corsair Void Pro RGB comes in numerous flavours, including wireless, wired and a non-RGB, wired ‘Surround’ version. I tested the middle, wired RGB model, and this is another headset that rates highly on the comfort scale. 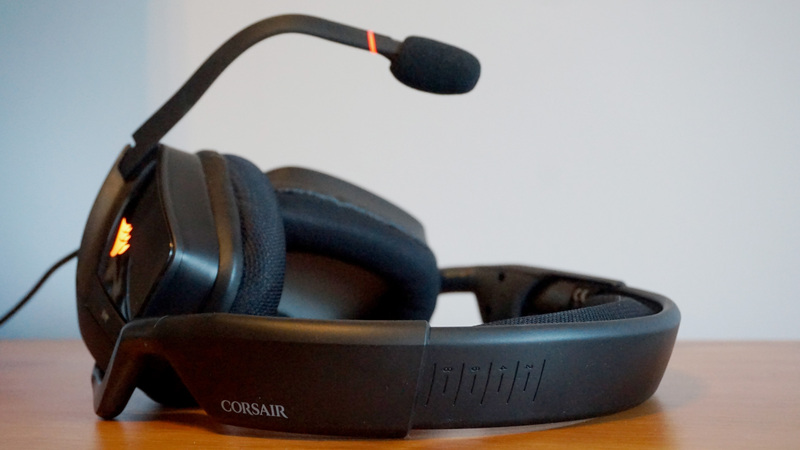 Corsair’s headsets have a much looser design than most, so they’re less prone to the dreaded head pinch as a result. They’re perhaps not the best pick for those with smaller heads, but those with larger skulls or a lot of hair to contend with will no doubt appreciate the extra wiggle room. The Void Pro RGB also has an excellent microphone, and is usually my headset of choice when I put in the occasional appearance on The RPS Electronic Wireless Show. 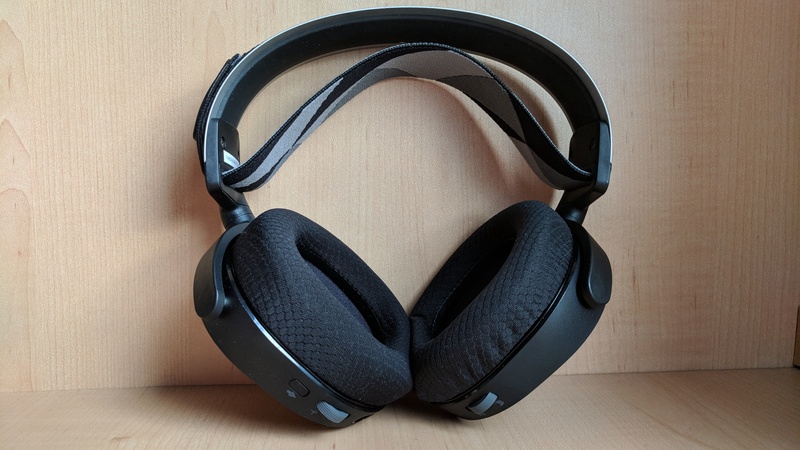 It’s a great sounding headset as well, but its virtual 7.1 surround sound effects aren’t the best, hence its position as ‘runner-up’ rather than our overall winner. You also need to fire up Corsair’s iCue software to use it, as there isn’t a dedicated button to enable it on the headset itself. Still, if you’re after a tasteful RGB headset that doesn’t cost the earth, the Corsair Void Pro RGB is a great place to start. Read more in our Corsair Void Pro RGB review. An honest-to-goodness wired gaming headset, the Turtle Beach Atlas Three is the rather excellent middle-child in Turtle Beach’s new range of PC gaming headsets. Not only is it super comfortable to wear for long periods of time, but its audio quality is also absolutely brilliant, making this sub £70/$80 a right old steal compared to some of the more expensive headsets on this list. It’s a little odd, in that it’s got a built-in bass amplifier that needs to be charged every so often via the bundled USB cable despite it already having a wired 3.5mm audio connection, but enabling this dramatically improves your in-game audio and makes for a rather good general listening companion as well. The only niggle I have with the Atlas Three is the layout of its on-ear controls, which I constantly get mixed up when I use it myself. Still, it’s something I’m more than willing to put up with at this price, and it doesn’t detract from what’s otherwise a great mid-range headset. 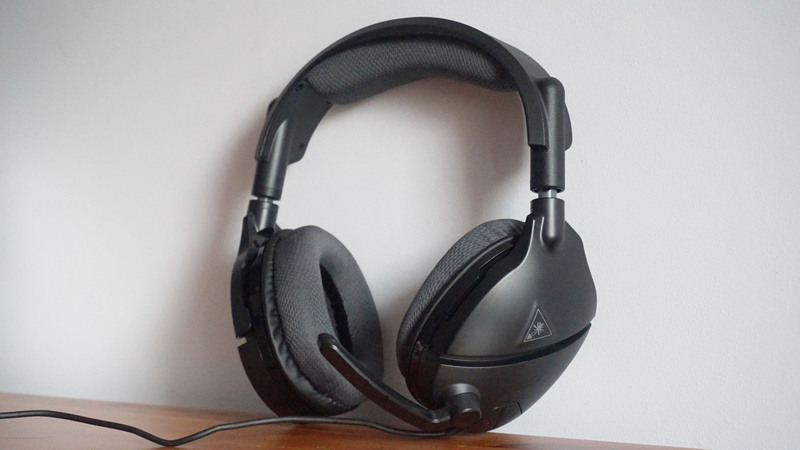 Read more in our Turtle Beach Atlas Three review. The Cougar Phontum is by no means perfect (its microphone may as well go in the bin), but at this kind of price, it’s still a great buy for those on a budget. 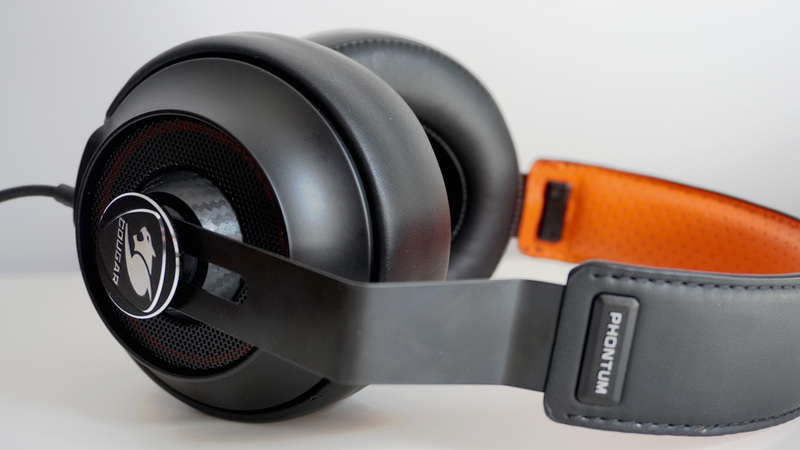 With its metal frame and large, plush ear cups, the Phontum’s build quality is outstanding for a headset that costs less than £50 / $50, and it’s infinitely preferable to the overly plastic construction of its nearest rival, the Turtle Beach Recon 150. As mentioned above, the microphone is pretty useless (let’s blame that on Cougar’s Metal Gear-esque naming conventions), and its high/treble reproduction isn’t as good as more expensive headsets, but its overall audio quality is perfectly good enough for the money. If you’re looking for something inexpensive to give to your kids or younger siblings, the Cougar Phontum is well worth considering. Read more in our Cougar Phontum review. Let’s face it, wireless gaming headsets are pretty expensive. As you’ve no doubt seen on this list, the best ones demand well over £120 / $150 in most cases, which can often be a step too far for those looking to keep costs down. Thankfully, Corsair has come up with a solution – the brilliant HS70. It’s still a fair chunk of change, I’ll admit – especially for those in the UK – but the HS70 is an absolutely superb headset in its own right. It doesn’t have as many fancy features as the Arctis 7 or the battery life of the Cloud Flight (although its 16 hours of uninterrupted air time is still nothing to be sniffed at), but if you’re after something simple that gets the job done, feels great and doesn’t involve trying to unravel a million cables, the HS70 is the headset for you. Read more in our Corsair HS70 review. If you’ve got money to burn and want the absolute best of the best, look no further than the Steelseries Arctis Pro + GameDAC. Not to be confused with its more expensive wireless and cheaper GameDAC-less Pro siblings, this middle offering in Steelseries’ Arctis Pro line-up is arguably the best of the lot – if only because it’s the only one to have proper Hi-Res audio support. Hi-Res audio isn’t the be all and end all for games at the moment (see our buying guide below for more info), but if you’ve got lots of Hi-Res audio tracks that you listen to at home or subscribe to services like Tidal, this could be a handy solution that meets both your home and game listening needs without having to buy a second pair of headphones. Combined with that handy titular GameDAC control that gives you every settings option you could possibly want right at your fingertips (all on a lovely big tactile dial, to boot), this is the best and comfiest way to get 96kHz, 24-bit audio from your game library and beyond. 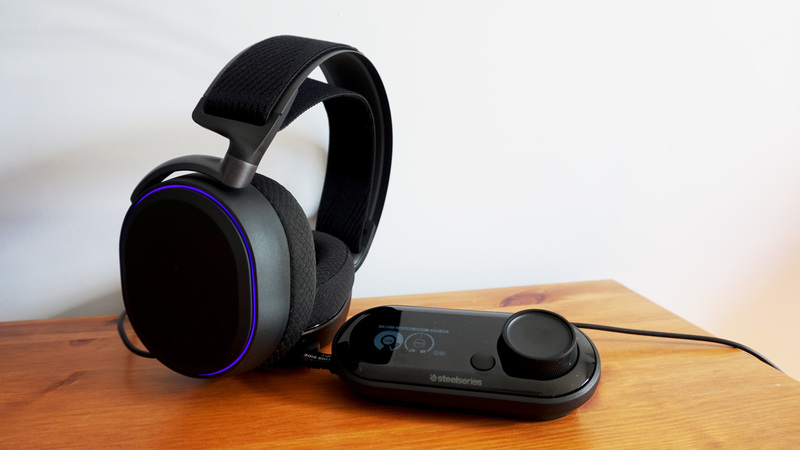 Read more in our Steelseries Arctis Pro + GameDAC review. I’ll be upfront. Testing a gaming headset can be an extremely subjective experience. Personally, I prefer a balanced headset whose bass doesn’t drown out the highs, and I use a number of audio tracks to help test this – both in and out of games. To get a feel for the headset, I fire up my Final Fantasy XV soundtrack in iTunes, paying special attention to how it handles the battle theme of Hunt or Be Hunted. This particular track has a lot going on with a number of different instruments in play, from its busy bass section to its fast and frantic piano and strings melodies. If a headset can handle this without one section overwhelming another, we’re onto a winner. If I need extra reassurance, I throw in a bit of Omnis Lacrima for good measure. To make sure a headset can handle lighter instrumental tracks, I use a combination of Final Fantasy XV’s Piano Collection soundtrack, Austin Wintory’s Transfiguration EP from Journey, Ace Attorney’s Gyakuten Meets Orchestra concert, and a light sprinkling of my Breath of the Wild: Sound Selection CD and the Bravely Default soundtrack. I also listen to regular bands and songs, including the likes of Turin Brakes, Queen, Maximo Park, a bit of David Bowie and the opening themes to space anime Knights of Sidonia and grim naked giant anime Attack on Titan, again testing for overall balance, clarity and general toe-tapping grooviness. In-game, I focus on three main titles. Normally, I start with Doom and run through its first UAC level, listening out for overall punchiness, whether its head-squelching sound effects are drowned out by the thumping bass, and more importantly, how good the Super Shotgun sounds when you unleash its double-barreled fury on an unsuspecting imp. Next up is Hellblade, where I sit back and listen to the internal voices whirling around inside Senua’s head during the game’s opening boat sequence. Since Hellblade uses binaural audio techniques (which uses two microphones to accurately measure the distance between your head and where the sound’s coming from to create a proper 3D, 360-degree soundscape – try these examples with a pair of headphones on to see what I mean), this is a great test of how a headset can be immersive and create a fully-believable sense of place. I listen to see how up close and personal the main narrator can be, as well as how the other voices come and go and titter around the periphery. If a headset can make my spine tingle (as some of them have), this is a good sign. Lastly, I boot up Final Fantasy XV proper to check my earlier findings in the game itself. Previously, I also gave The Evil Within a quick blitz to make sure those classic zombie groans came through loud and clear against the rest of its ominous soundtrack. Next, I record myself talking for a bit in Audacity to see how its microphone performs, and I also try to wear the headset for as long as possible to see how comfortable it is over long periods of time. Admittedly, a lot of headsets tend to struggle in this area for me, as I’ve either got a head that’s secretly shaped like a Minecraft block underneath all my hair, or every headset manufacturer on the planet has a mysterious grudge against me and they’ve collectively designed each of their headsets to only last for about 30 minutes before they start to press down and pinch the top of my head. Obviously, the longer I can wear one without this happening, the better. Gaming headsets broadly fall into two categories: wired and wireless. 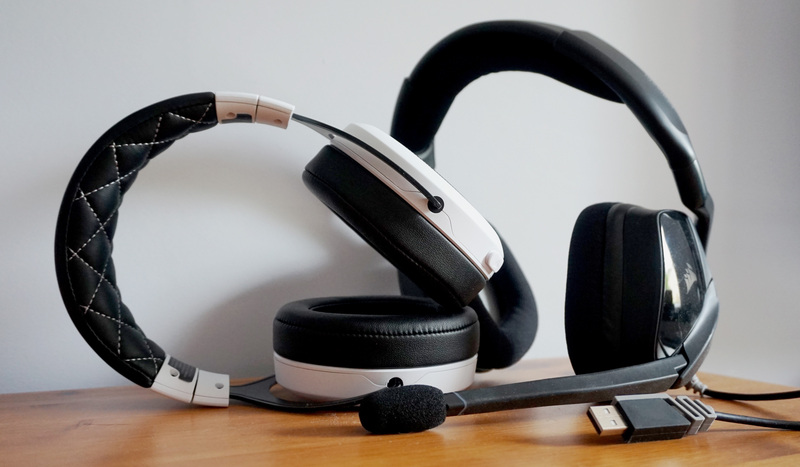 Wired headsets are arguably the most common, with most plugging into a USB port or a 3.5mm audio connection, while wireless ones are, well, wireless. Wireless headsets are generally more suited to those there console boxes that sit beneath your TV so you can lounge around on your sofa without falling over a string of cables every time you get up to make a cuppa, but they’re also a good choice if you want to cut down on the warren of PC cables you’ve got building up behind the back of your case. Just bear in mind that you’ll still need a free USB port for their wireless transmitter or dongle, as well as somewhere to charge them when they run out of juice. What’s all this 7.1 surround sound stuff? You’ll also see a lot of gaming headsets claiming they can do 7.1 surround sound. In a traditional audio setup, a 7.1 system would require seven individual speakers and a subwoofer (the .1 bit). The kind of headsets we’re dealing with, however, will only ever have two speakers (one for each ear), so any headset that says it can do 7.1 surround is usually going to be doing it virtually via onboard software and its own internal algorithms. Virtual surround sound is by no means a bad thing. Yes, it’s not as good as proper 7.1 surround sound, but in some cases it can help make music feel more immersive and all-encompassing than regular stereo. However, poor implementations of it can often destroy any sense of intimacy or breathing-down-the-back-of-your-neck-style dialogue, and it can sometimes make your game audio feel like it’s been turned into one great big echo chamber, so don’t be fooled by what it says on the box. Do I need a Hi-Res audio gaming headset? We’re also starting to see more Hi-Res audio certified headsets starting to appear, but don’t get too bogged down in making sure you get one. Hi-Res (or High Resolution) audio is meant to provide the absolute pinnacle of music quality, with audiophiles saying it’s akin to ‘being right there in the recording studio’ when you listen to it. Put simply, Hi-Res audio has a much higher sampling rate (also known as bit-depth, or the number of samples taken per signal per second in the analogue-to-digital conversion process) than CD quality audio, which is meant to make it more accurate and more detailed than anything else currently available. To throw some numbers into the mix, CD is specified at 16-bit or 44.1kHz, while Hi-Res audio is usually defined as either 96kHz or 192kHz at 24-bit. This is great if you already own lots of Hi-Res audio tracks or subscribe to something like Tidal, but as for gaming… it’s currently unknown how many, if any, actually support Hi-Res audio or whether you get any extra benefit over non-Hi-Res audio headsets. Personally, I’ve never been able to tell the difference between Hi-Res and CD, and that’s after multiple demos and tech PRs doing their darnedest to convince me otherwise. As a result, it’s probably worth it if you’re into Hi-Res audio stuff outside of gaming, but don’t go paying extra if you’re only going to be using it for games. Tagged with Corsair, Cougar, feature, Hardware, Headsets, HyperX, steelseries, Turtle Beach.